Crystal Head Vodka is a popular Vodka available from TheDrinkShop in 1.75l to buy online. Visit TheDrinkShop for the best price for 1.75l of Crystal Head Vodka or compare prices on our other Vodka products. Crystal Head Vodka is quadruple distilled and triple filtered through Herkimer diamonds. Produced from water sourced from a deep glacier lake in Newfoundland Canada, Crystal Head Vodka is a 'PURE SPIRIT', and contains NO additives, No glycerin, No citrus oil and No sugar. Tasting Notes: A slight sharpness to the tongue, with a creamy mouth feeling and a smooth, clean finish. 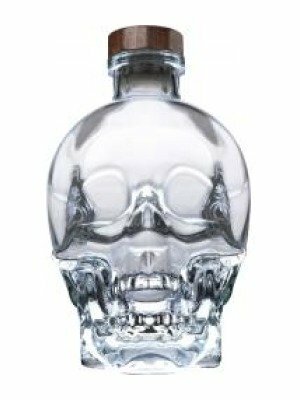 You can buy Crystal Head Vodka online in most retailers and find it in the Vodka aisle in supermarkets but we found the best deals online for Crystal Head Vodka in TheDrinkShop, DrinkSupermarket.com, and others. Compare the current price of Crystal Head Vodka in 1.75l size in the table of offers below. Simply click on the button to order Crystal Head Vodka online now.